Andhra Pradesh, Commissioner of School Education Department Officials will issue the Transfers Schedule in this month and they have placed online application for Teachers Transfers on CSE web portal for applying. Instructions: The Head Master Gr.II (Gazetted) or Teacher who is eligible as per Govt. Orders should apply online through CSE website specified for the purpose in the prescribed online application proforma and the particulars furnished in the proforma should be final and no modification should be allowed. The applicants should thereafter obtain the printout of the transfers application from the specified website and submit the same duly signed to their respective authorities, viz., Mandal Educational Officer/Head Master High School / Deputy Educational Officer, as the case may be. An applicant seeking to apply under Preferential categories / spouse category shall also submit along with application the latest Certificate from the competent authority in that regard. If any Head Master, Gr.II (Gazetted) / Teacher who is compulsorily transferable under Rule 5 does not apply online or having applied does not attend the counseling (physical or online), he/she will be transferred to the available left over needy vacancies. * Online submission of preferences of vacancies through Web Based Selection Service. 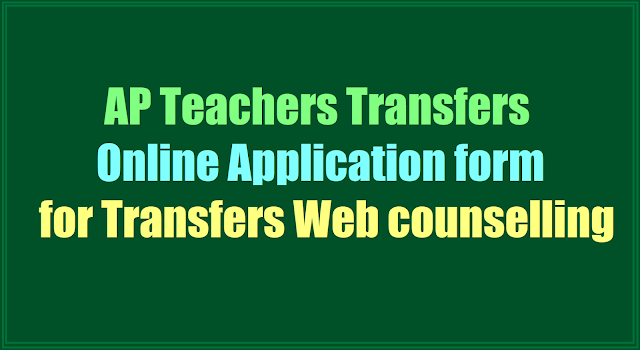 Guidelines for the filling up the Transfers Application and Web Options by the HM/Teacher: Welcome to all the Headmasters and Teachers to the online, web based transfer counselling system. This is designed to facilitate an easy, transparent, objective way of identifying vacancies, filing transfer application and making options/choices one is interested in. The Centre for Good Governance (CGG) is providing al technical support to facilitate the online application submission and web options exercising and drawing up of seniority lists and transfer lists. Step 3. Fill in the application form as per the instructions given in the User Guide and Government Orders and also keeping in mind the clarifications issued from time to time. Step 6. The application will be opened. v) Management in which appointed. (i.e., Local Bodies/ Government). vi) Exercise option, if HM/Teacher desires to transfer from current management to initial appointed management. vii) Select the calendar Date since when he/she is working in the present school. The system will calculate the period as per the norms given in the Government Orders. viii) Select the Category of the present school (I/II/III/IV). In case of change, a provision is given for changing the category of the school in last 8 years. ix) Select calendar date informing date of first appointment and Category of the post. x) Select the classes and subjects (if teaching multi subjects/classes upload all the details) during the last academic year 2016-17, to calculate the CCE Internal Marks. xi) Select the level of participation i.e. National / State Level if he/she wants to avail points under National/State Teacher awards, Participation in Sports, Inspire or Science Exhibitions. Step 9. If HM/Teacher wants to avail Spouse points then give details like Treasury Id, Name, Designation, Working office, District, Mandal, of the spouse. b. If he/she is working as NCC officer, then select working wing i.e. Navy/Airforce/Army from drop down menu. b. School Performance points, i.e. increase in enrolment, transition, CCE, School % performance in SSC exams, and MDM marks. c. Individual performance points i.e., CCE, performance in SSC exams. a. After filling all the details, press PREVIEW button,it will display the details submitted by them. c. If some of the details are not found to be correct, press EDIT and resubmit the information. d. Verify the correctness of the entitlement points obtained before the submission of their applications. e. On submission of application form online the candidate shall be given reference ID number which should be kept carefully for any kind of future correspondence. Submission of application can be considered to have been completed only on receiving reference ID number. f. On completion of submission, the candidates shall take a printout of the application, along with the certificates and store it for future use. a. HM/Teacher claiming the points mentioned below, need to upload the certificates as indicated in Government orders. e. If NCC officer, the certificate issued by the Commandant Officer, if Bharat Scouts and Guide, the certificate issued by the DEO concerned f. Sports participation certificate counter signed by Chairperson, SMC committee. a. At all MEO Offices, a computer with net connectivity and support of computer operator will be provided and interested HMs/Teachers may visit the MEO Office for entering the online application form and submitting their options. b. In case of any clarifications before, during or after submission of application online, the candidates may contact the Help Desk Phone no: 040-23120431,23120432 of Centre for Good Governance (CGG) between 10.30 a.m. and 5.00 P.M on all the working days. a. For domain, related clarifications, contact IT Cell at respective districts. b. After submission of online application, if any corrections are noticed by HM/Teachers request has to be raised at DEO office for any correction. b. Candidates should not post the printout of the application to any office. d. After verification of all the applications by MEO/Dy EO/DEO, a Tentative Seniority list will be generated in their respective Category of post, Subject, Medium based on the entitlement points obtained by the HMs/Teachers. b. Request Transfer Applications of HMs/Teachers will be allowed to participate in the web counselling once they confirm the willingness through OTP generated password. c. No OTP will be generated or communicated to the Teachers/HMs under compulsory transfer as they need not confirm their willingness. Step 17. Final seniority list will be generated after completing the above process and as confirmed by the District Educational Officers concerned. Step 1: Enter valid URL (http://cse.ap.gov.in/DSE/); the CSE AP home page screen will be displayed. Step 2: Click on Teacher Transfers Online Application Submission/Print Form as shown in the home screen. Screen 6: After clicking on Submit button the filled application form will be displayed. Note download the Application Number for further MEO Approval and Click on Print button for taking the printout of the receipt, click on Back button to go back to the application page as shown in th below screen. Screen 7: Click on Print Application Form link for taking the printout of the application as shown in the below screen. Screen 8: After Clicking on Print Application Form link the following screen will be displayed. Enter the Application Number and click on Search button as shown in the below screen. (ii) Only online applications received through the website will be considered for transfer. The teachers must submit their application for further processing. (iii) The applicants shall thereafter obtain the printout of the application from the specified website and submit the same duly signed to their respective authorities, viz., Mandal Educational Officer/Headmaster High School/Deputy Educational Officer, as the case may be. (This is only for verification – hard copies are not processed for transfer). (iv) The Headmaster Gr.II Gazetted / Teacher who is eligible as per the criteria prescribed in Rule 5 may apply online through website specified for the purpose in the prescribed proforma and the particulars furnished in the proforma shall be final and no modification shall be allowed. (v) An applicant seeking to apply under Preferential categories / spouse category shall also submit along with application the latest certificate from the competent authority in that regard. (vi) After receipt of applications, the authorities concerned shall display the provisional seniority lists and call for objections if any. After redressing the objections / grievances, the authority shall display the final seniority along with the entitlement points in the website / notice board. (viii) If any Headmaster Gr.II Gazetted / Teacher who is compulsorily transferable under Rule 5 does not apply online or having applied does not attend the counseling (physical or online), he/she will be transferred to the available left over needy vacancies. (ix) Any HM / Teacher who is under compulsory transfer and does not apply / submit his / her transfer application serious view will be taken against the Teacher / H.M. and M.E.O. and appropriate disciplinary action initiated. How many points given in councelling to 2013 non relieving teachers. 5 Points to be given to the 2013 teachers..
Sir,performance parameters anni last 2 years ka?leka individual parameters last 1 year ka?plz clarify. you can apply again and again ... the application which you submit to the DDO is final.. In go 32 it is mentioned that preference should be given to widow teacher , but there is no option in the application form , how can they get benefits ?